It was still only a skeleton of metal hoops and poles, but the cone shape was unmistakable. The mall Christmas tree was going up... in September. This will be our fourth Yuletide in the Philippines, but Mr. Noodle and I are still surprised when festive decorations start popping up so early in the year like mushrooms after a spring rain. 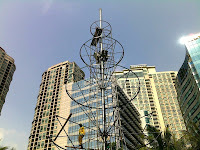 It's not far off the mark: Christmas and its attendant decking of halls begin just as the monsoon season, called Hanging [pronounced HA-ngeen] Habagat, winds down and the country starts wringing itself dry in preparation for a four month-long holiday. This period, known as the -ber months, takes its name from the suffix shared by the last four months of the year, but to my ears, it sounds a lot like a wintry shiver. Brrrr - baby, it's cold out there! In this part of the world, 'four seasons' is a hotel. When the only seasons are 'rainy' and 'not rainy' (also known as Hanging Amihan), fluctuations in temperatures that help signal the progression of time are slight. So, the months tumble into each other, composed of days that vary only by the intensity of the sun or the force of the rain. 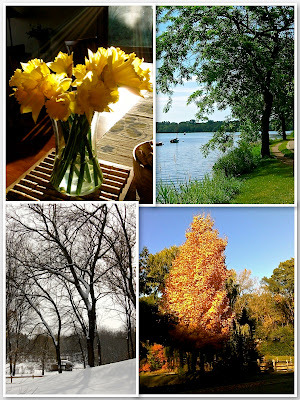 Missing are the segues between seasons that we experienced living in Minnesota, when other cues beyond a calendar told us it was time to bundle up in sweaters and fleece-lined boots, or strip down to swimsuits and flip-flops. Most of the time, seasonal signals came from the digital thermometer that hung just outside our kitchen window and whose readout went from blistering three digits to bone-chilling negative numbers in the course of a year. During the winter, I would groggily peer at it in the dim light of dawn, as the coffee maker hissed and gurgled away, promising a bit of warmth to start the frigid day. Other times, the markers were the foliage and flora surrounding our house, such as the tender green buds that seemingly appeared overnight on our copper chokecherry tree during spring. I would often gaze at the dainty branches through the window of my study, daydreaming when I should have been studying or writing or cleaning. But who could work when the sun beckoned outdoors? In the summer, it was the grass that needed to be cut every weekend; the weeds that needed pulling every day; and the Pupster who looked forward to an hour-long walk down the bike path every morning, sniffing at spots where deer had stopped to graze, and chasing after squirrels who chittered tauntingly once they reached the sanctuary of some tree. 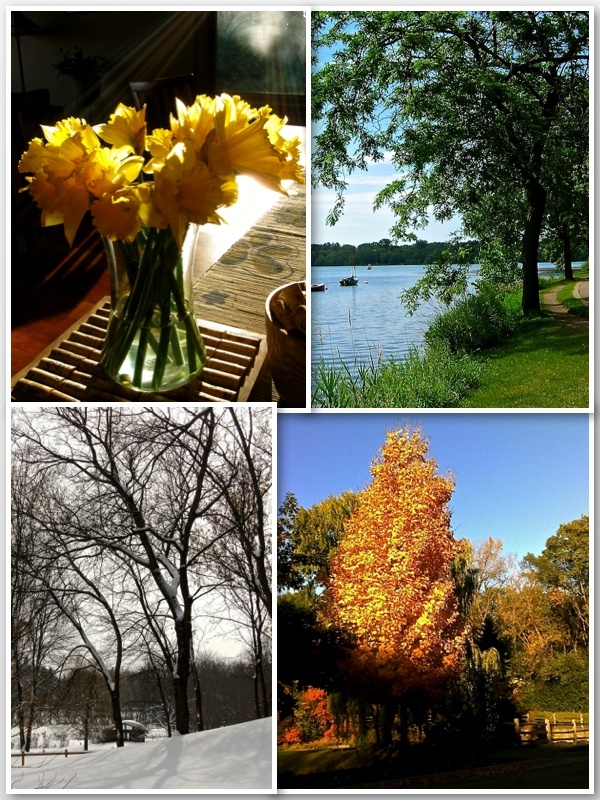 Autumn was heralded by summer's last hurrah at the Minnesota State Fair, by the start of classes, and by the fiery foliage that exploded along the Twin Cities' avenues and along the trails that edged the shores of the Chain of Lakes. 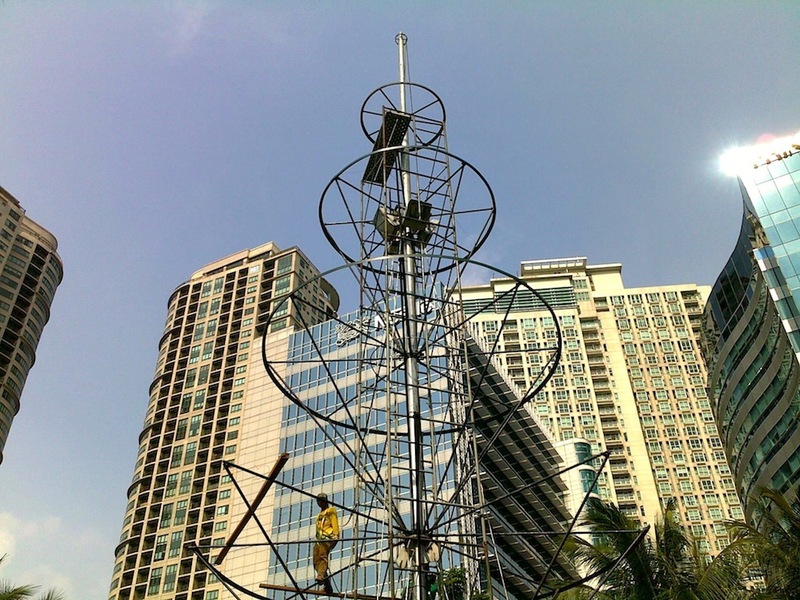 Now, as I hurry along a Makati sidewalk in a cotton sundress and favorite sandals, wishing I'd also worn a hat against the bright sunlight, I'm stopped in my tracks by the sight of a giant Christmas tree being assembled. I'm taken aback not just because it's only the first week of September; it's also the sudden realization that two-thirds of the year has passed and I hardly noticed. The palm trees didn't turn red, gold and orange, and shed their fronds to form a carpet of leaves below; raindrops didn't turn into crystalline shapes that fluttered down to cover the ground in pure white. There were no vegetables to be harvested one last time before Mr. Noodle can pull out weeds and old stems to prepare the garden for next spring. There have been many happy changes for us since moving here, but a part of me wishes the seasons were still one of them. 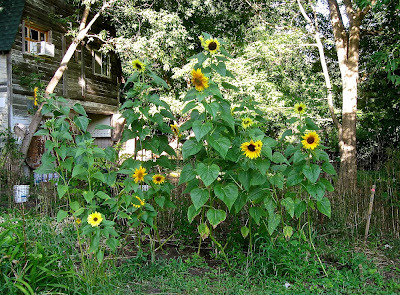 Mr. Noodle's pride and joy back in Minnesota were the two garden plots he tended in our backyard. He grew sunflowers, cucumbers, peppers, lettuce, onions and cantaloupe, but his biggest successes were tomatoes and zucchini. In fact, I didn't realize how prolific one zuke plant could be. It seemed as if there were full-sized squash that needed to be picked every day; otherwise, they kept growing until some were the length and circumference of my arm! Throughout the summer, I chopped and grated endless zucchini for a meal or to freeze for use over the winter. Of all the combination of vegetables, these two will always remind me of the transition from summer to autumn in Minnesota. 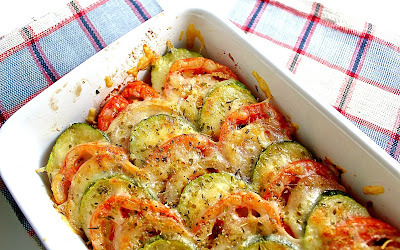 I put together this zucchini and tomato casserole for my first freelance article about cooking for two, published in lifestyle and interior design magazine Cocoon. This recipe fits a 4.5”x7” casserole. Place the baguette slices on a small cookie sheet, brush with olive oil and sprinkle with a bit of salt. Toast in the oven until just lightly golden. When done, brush the bottom of a small casserole dish with olive oil then arrange the toasted baguettes in one layer. Sprinkle with ¼ cup mozzarella and half of the Parmesan cheese. Set aside. Using a mandoline, slice zucchini, tomatoes and onion to 1/8” thickness. If using a knife and cutting board, slice as thinly as manageable. 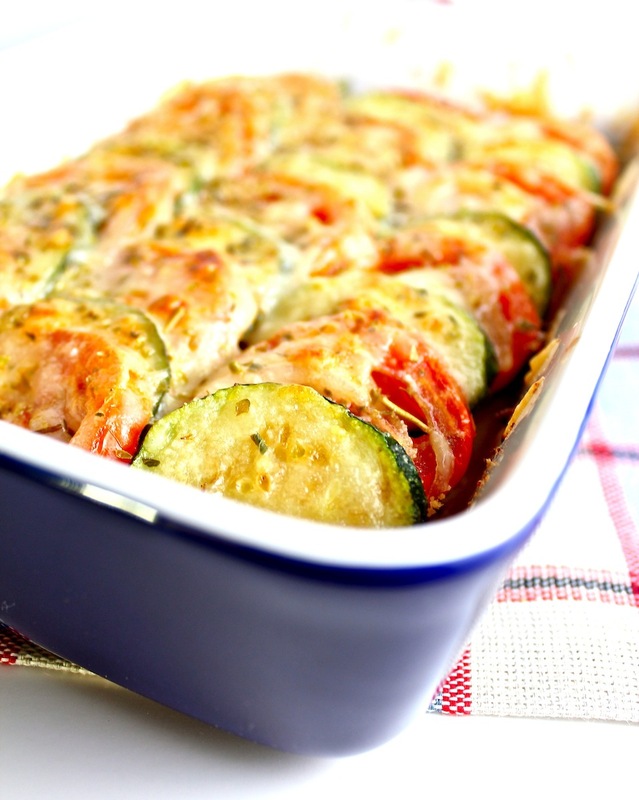 Place zucchini slices in a small bowl, add 1 tablespoon of olive oil and a dash of salt, and toss to coat. 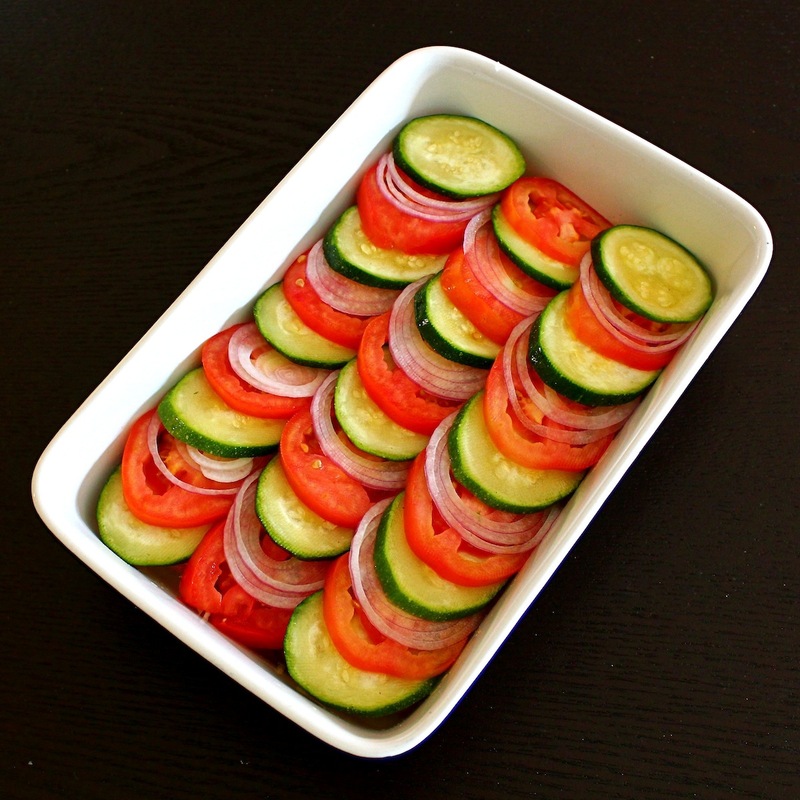 Alternating between the zucchini, tomato and onion, arrange the slices over the baguettes so that the vegetables overlap each other. Brush or drizzle with olive oil and sprinkle with coarse salt. Spread remaining mozzarella and Parmesan evenly over the vegetables then sprinkle with dried herbs. Bake in the oven for approximately 25-30 minutes or until cheese is golden and bubbly. When done, remove from oven and let sit for about 5 minutes before serving. Can not wait to try this... it looks like simple comfort food at its best. I also love making a simple layers of zucchini and tomatoes like the one you make here. Such a pretty and simple way of serving them. First of all, it has been a while since I've stopped by so I'm not sure when the blog look changed, but I absolutely love it! Looks great! I was in NYC at the end of Oct and they were scoping things out for the big tree while I was doing the tourist thing. It's amazing how such simple things can have such amazing flavor. This looks so good!